Theophilus of Antioch - most likely was the first person to use the word Trinity, sometime in the 2nd century. John Calvin - burned Michael Servetus at the stake because of his non-Trinitarian beliefs. Ellen G White - initiated the Seventh Day Adventist movement in the 19th century. Joseph Smith - initiated the Mormon movement in the 19th century. Charles Taze Russell - initiated the Jehovah Witness' movement in the 19th century. Beloved, do not believe every spirit, but test the spirits to see whether they are from God, for many false prophets have gone out into the world (1 John 4:1 ESV). Beware of false prophets, who come to you in sheep's clothing but inwardly are ravenous wolves (Matthew 7:15). I appeal to you, brothers, to watch out for those who cause divisions and create obstacles contrary to the doctrine that you have been taught; avoid them. For such persons do not serve our Lord Christ, but their own appetites, and by smooth talk and flattery they deceive the hearts of the naive (Romans 16:17-18 ESV). For the time is coming when people will not endure sound teaching, but having itching ears they will accumulate for themselves teachers to suit their own passions (2 Timothy 4:3 ESV). 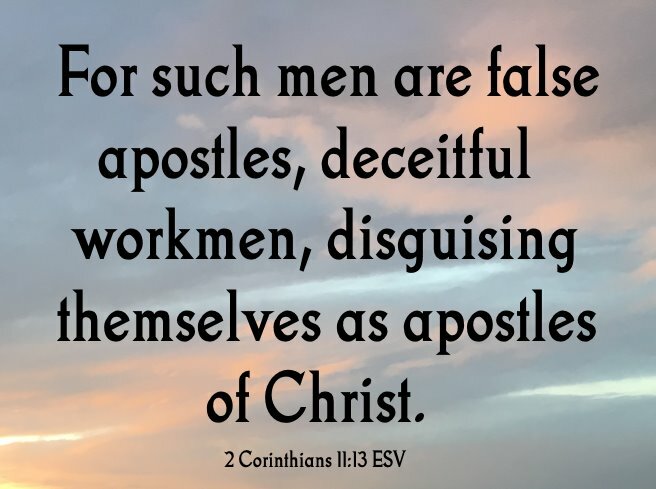 For such men are false apostles, deceitful workmen, disguising themselves as apostles of Christ (2 Corinthians 11:13 ESV). Pay careful attention to yourselves and to all the flock, in which the Holy Spirit has made you overseers, to care for the church of God, which he obtained with his own blood. I know that after my departure fierce wolves will come in among you, not sparing the flock; and from among your own selves will arise men speaking twisted things, to draw away the disciples after them (Acts 20:28-30 ESV). And no wonder, for even Satan disguises himself as an angel of light (2 Corinthians 11:14 ESV). And count the patience of our Lord as salvation, just as our beloved brother Paul also wrote to you according to the wisdom given him, as he does in all his letters when he speaks in them of these matters. There are some things in them that are hard to understand, which the ignorant and unstable twist to their own destruction, as they do the other Scriptures. You therefore, beloved, knowing this beforehand, take care that you are not carried away with the error of lawless people and lose your own stability. But grow in the grace and knowledge of our Lord and Savior Jesus Christ. To him be the glory both now and to the day of eternity. Amen (2 Peter 3:15-18 ESV). Not everyone who says to me, ‘Lord, Lord,’ will enter the kingdom of heaven, but the one who does the will of my Father who is in heaven (Matthew 7:21 ESV). While evil people and impostors will go on from bad to worse, deceiving and being deceived (2 Timothy 3:13 ESV). But even if we or an angel from heaven should preach to you a gospel contrary to the one we preached to you, let him be accursed (Galatians 1:8 ESV). But false prophets also arose among the people, just as there will be false teachers among you, who will secretly bring in destructive heresies, even denying the Master who bought them, bringing upon themselves swift destruction. And many will follow their sensuality, and because of them the way of truth will be blasphemed. And in their greed they will exploit you with false words. Their condemnation from long ago is not idle, and their destruction is not asleep (2 Peter 2:1-3 ESV).